Understanding each license type and picking the right one for you. An Adobe Stock license allows you to use your asset anywhere in the world, and the license never expires. You may use the asset in print, presentations, broadcasts, websites, and on social media sites. However, you may not share or distribute the asset in any way that would let others use the asset without licensing it themselves. Reproduce up to 500,000 copies of the asset in product packaging, printed marketing materials, digital documents, or software. Include the asset in email marketing, mobile advertising, or a broadcast program if the expected number of viewers is fewer than 500,000. Post the asset to a website with no limitation on viewers. If the asset is used in an editorial manner, attribution is required in this format (© Author Name - stock.adobe.com). Include the asset in products in a minor way, such as in a textbook. Create merchandise or products for resale or distribution where the main value of the product is associated with the asset itself. For example, you can't use the asset to create a poster, t-shirt, or coffee mug that someone would buy specifically because of the asset printed on it. Enhanced licenses are available for Adobe Stock Premium collection images, videos, templates, editorial and 3D assets. Use the asset with all the rights granted in a Standard license. Reproduce the asset beyond the 500,000 copy/viewer restriction. Create merchandise or products for resale or distribution where the main value of the product is associated with the asset itself, such as a coffee mug or t-shirt. Extended licenses may be purchased for most images by clicking the image thumbnail to open the detail view, then selecting the "Extended license" tab. 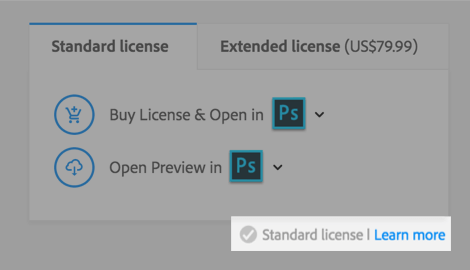 Images which have already been licensed can be licensed again with an Extended license by clicking "License Again" in the License History page. Extended licenses do not consume licenses from your subscription. May be used in any context that is newsworthy or of cultural interest, typically in newspaper or magazine articles, news blogs, or similar event-based media. May not be used for commercial purposes such as advertisements, promotions, advertorials, merchandise, etc. - even if you have obtained an extended license - without obtaining prior written consent from third parties such as the copyright owner of the asset, or, where necessary, from recognizable persons or unique buildings or objects identifiable in the asset. May not be edited, except for minor adjustments for technical quality or slight cropping or resizing, and only if you maintain the editorial context and meaning of the original. When editorial images are used in print, websites, blogs, and so on, you must include the credit line shown on the site and contained in the IPTC credit line field, for example, "Agency Name/Author Name - stock.adobe.com". When editorial images or videos are used in films, TV shows, podcasts, and so on, you must include the credit "Image(s) and/or video(s) used under license from Agency Name/Author Name - stock.adobe.com". Most Adobe Stock assets come with a standard license. Extended licenses may be purchased for standard images if a Standard license is not suitable for your needs. Assets labeled "Editorial Use Only" are for use in news and events-related articles, blogs, film and broadcasts. You can view the type of license associated with an image on the image preview page in your web browser. This Adobe Stock licensing information is intended for individuals and Creative Cloud for teams members only. Enterprise users, see the Enterprise License page. If you're not sure what type of license you have for a specific asset, or if you need to purchase an additional license for an asset, click your name in the navigation bar to open your License History page. For complete details and additional restrictions, see our full Terms & Conditions.